2. It charges the battery only during night. 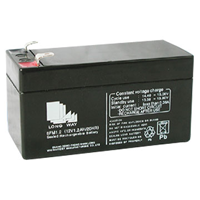 This save energy and prevents overcharging of the battery. The circuit is a Light controlled switch that connects the Emergency lamp circuit board with the power supply only during night through a relay. To keep the relay off during daytime, an LDR and a Schmitt trigger circuit are used. Light Dependent Resistor offers very high resistance around 10 Meg ohms in dark but in light it has only 100 ohms or less resistance. So it is an ideal component to switch on circuits based on the presence or absence of sun light. Here it is used to trigger the timer IC 555 which is designed as a Schmitt trigger. The popular Timer IC 555 has two internal comparators. These are Threshold comparator and Trigger comparator. The Set and Reset action of these comparators can be used for On/ Off actions. Here the IC 555 functions as a Bistable with Schmitt trigger action. 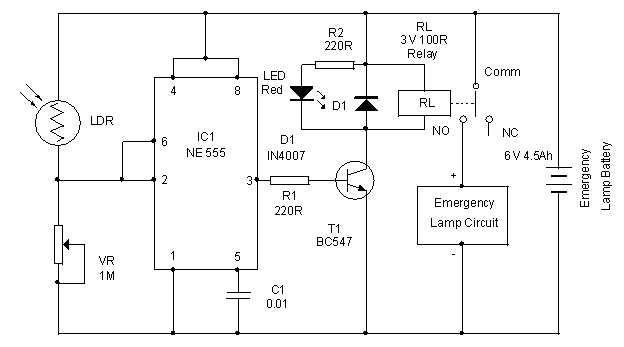 The upper comparator (Threshold comparator) of IC 555 trips at 2/3 of the supply voltage and the lower comparator (Trigger comparator) trips at 1/3 of the supply voltage. In the circuit, the inputs (pin6 and pin2) of both the comparators are shorted and connected to the junction of LDR and the Preset VR. In day light, LDR passes more current and the current into the upper comparator (pin6) is above 2/3 Vcc. This resets the internal Flip-Flop of IC. At the same time, the current into the lower comparator (pin2) is more than 1/3 Vcc. Both these condition causes low output from IC1. This low output keeps T1 off and the relay also remains off. Battery power supply to the emergency lamp circuit is connected through the Common and NO (Normally Open) contacts of the relay. So during daytime the emergency lamp circuits do not get power. The charging process is also prevented since the connection between the emergency lamp circuit and the battery is broken. During night, LDR cease to conduct and the Schmitt trigger changes its state and output of IC1 becomes high. This triggers T1 as indicated by the LED. Relay then energizes and the NO contact makes connection with the Common contact of the relay. This connects the battery with the emergency lamp circuit. Assemble the circuit on a Perf board and fix it inside the emergency lamp. Power to the circuit is obtained from the emergency lamp battery. Cut the positive supply wire of the emergency lamp circuit that goes to the battery. Solder the cut ends to the common and NO contacts of the relay. Adjust VR till Relay energize at a particular light level in the evening. Keep LDR on the back side of the lamp to prevent light falling on it.